Features: Polar telemetry heart rate monitoring system with hand held heart rate sensors. Hand rails designed for added safety and accessibility. Storage & mobility – Dual Gas assisted springs to help with raise and lower making storage and set up effortless. Interactive Heart rate Workouts: cardio, fat burn. 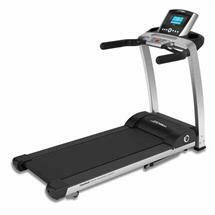 Interval Workouts: Random, hill heart rate hill, heart rate extreme, heart rate interval as well as sports training and EZ incline. Display Readout: Elapsed time, Watts, Mets, speed, resistance, total calories per hour burned, workout profile, heart rate and distanced covered. Built in accessory reading tray and drinks holder Dimensions – Unfolded – Length 198cm, width 87.5cm, height 148.5cm. Elevation – 0% – 12% (in 0.5 % increments). 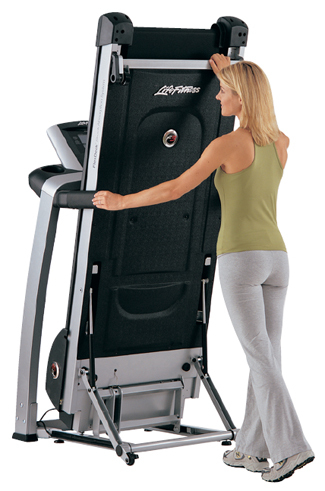 Treadmill offered with basic or advanced console. 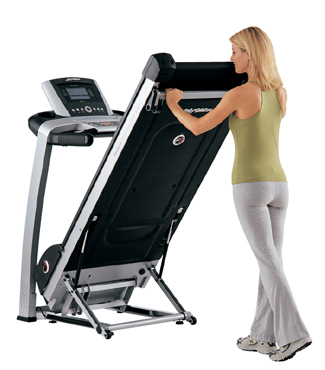 Treadmill offered with a Basic or Advanced console. Dual Gas assisted springs to help with raise and lower making storage and set up effortless. Built in accessory reading tray and drinks holder. Price includes a 12 month warranty.